Want a super-inexpensive RF-based remote control for your Boxee HTPC? One of your best options is the Snapstream Firefly RF Remote Control. And there’s a perfect profile you can add so that the firefly remote will control Boxee too. Oh, and as luck would have it, Snapstream has a nice sale on the Snapstream Firefly and Firefly Mini right now also. Just make sure you don't have 2 entries for the "Firefly" button. Here is the Boxee.xml code. For Windows XP save this xml file to: “C:\Documents and Settings\All Users\Application Data\SnapStream\Firefly\Profiles"
For Windows Vista save the xml file to "C:\ProgramData\SnapStream\Firefly\Profiles"
Step 3. 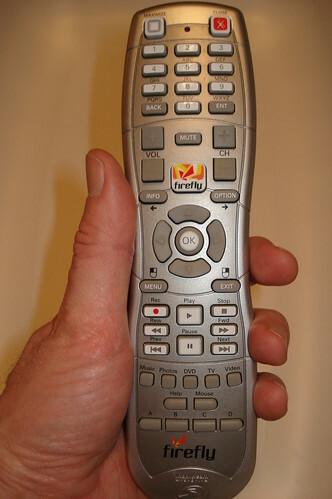 Now edit your Global.xml file to launch Boxee with the "Firefly" button on your Firefly Remote Control. And enter the coupon code “boxee” to get free shipping. Sale ends October 27th. Code via Boxee Forums – Thanks to tmar99 for the tip on the RC sale!